It’s now their eighth birthday and, as the last candle flickers out, they stand at a crossroads in life. Behind them are all the openness, innocence and unspoiled imagination of the young. Ahead lies a more serious world where they must compete and make the grade. As parents, the years ahead will test both our patience and stamina. The under-eights know all about disobedience, but they still see our proclamations as the one and only truth. Sadly, all good things come to an end, and our divine power starts to ebb at seven years. By the time our child is eight, all our words and actions come into question. Before, you could just lay down the law: ‘Because I say so.’ Now, you will get poor compliance without some explanation and good reason. In the past, you could tell them El Nino was caused by the French bombs in the Pacific. Now they laugh at your ignorance as they quote their teacher. Teachers are never wrong; mothers often are! This shift of power takes many parents by surprise. It was never mentioned in the owner’s manual: you had always believed that parents were in charge! Now you’re not so sure. The under-eights will spend the majority of their time at home. But after this age you may only see them at the pit stops, as they fuel up ready to hit the circuit again. Parents lose their monopoly position as other people exert their Influence. The soccer coach talks about the dangers of smoking, and now John confronts his puffing dad about fitness, heart attacks and toes dropping off. We have spent eight years teaching politeness, manners and healthy eating, and now the influence of their mates dismantles much of our hard work. They are now affected by the attitudes of the herd. They watch the ‘in’ TV programmes, wear the right sort of clothes and buy certain brands. This can be a strange time for parents, where we see less of our children and know they are being Influenced by others. The five- to eight-year-old s view of life is strictly in the here and now. But after eight they look into the distance and can see the permanent nature of events. If Grandma dies, they know she has gone forever and they now grieve like their parents. If a marriage breaks up they realise Mum and Dad have split for life. They can see how they will grow into an adult, and by twelve years some have started to develop major goals. The silly worries of the younger child have disappeared, but they are replaced by the usual insecurities, fears and paranoia that trouble most people between the age of eight and eighty years. The young child will breeze along, not too concerned by their differences and difficulties. But at eight, they start to worry about how others see them. They develop an awareness of looks, learning abilities, body shape, strength, mixing skills and social acceptance. We can tell our children they are bright, good-looking and wonderful, but they still match themselves against the group. They feel inadequate when they don’t make the grade, and with this can come problems of esteem and even depression. Before the age of eight they skipped, cuddled and believed in Santa. Now Santa is silly and skipping is for babies. The only time you will get a cuddle may be when they are almost asleep, ninety-eight per cent unconscious and unable to resist. If you open the door on a naked nine-year-old they cover everything and protest. Now there is no talk of ghosts, monsters and pretend people: the imagination moved out along with the magic .The once uncomplicated mind has matured to a more adult plane, and with this, the age of innocence has gone. One friend opened her washing machine to find it white with tissues. ‘Who left these in their pockets?’ she asked. They are also perfecting the art of put-downs. You make some earth-shattering observation to which they respond, with a yawn, ‘Fascinating, Dad Soon you are told your jokes aren’t funny, then your taste in music is geriatric, and that’s just the start. It gets worse in adolescence. There is a big difference between the mothering and spoon-feeding of the infants classes and what happens after the age of eight. From now on the successful students will need to self-motivate, organise and keep on task. Learning takes a giant leap forward during the years between eight and twelve. The average six-year-old can read single words; by twelve, they can manage simple newspapers. For eight- to twelve-year-olds, school is so important that those who have a learning weakness or who can’t stick at a task are hurt by failure and suffer in esteem. The use and understanding of language increases with age. At six years they can cope with a simple concept, for example, ‘Why does the sign on the petrol pump say “No Smoking”?’ By eight years they understand more complex questions and by twelve years they are fully versed in innuendo, double meaning and the subtle differences that come with a change in tone. This is also the start of abstract thought, where they take preprogrammed information and use it to create something new outside the programme. When little boys and little girls start school they enjoy one another’s company and are pleased to play together. But after eight, boys tend to play with boys and girls with girls. The boys often hunt in packs and don’t welcome children who are different or out of step. 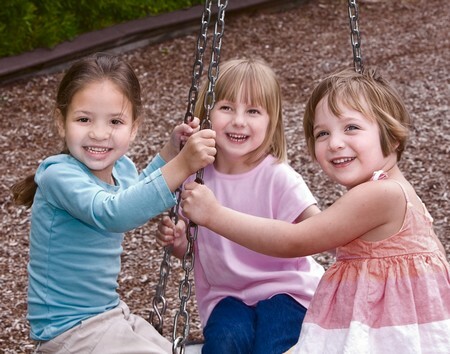 Girls usually play two or three together and are generally more accepting of those who are shy or less popular. The segregation that starts around eight remains an uneasy part of life until in adolescence, boys and girls reunite in a more individual way. Girls in general are easier-going and more mature. Boys have a higher incidence of learning difficulties and over-the-top behavior. The pubertal growth spurt hits girls before boys, but once growth sets in, boys become physically stronger and more solid.